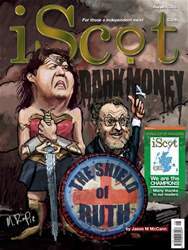 Digital Subscriptions > iScot Magazine > August 2018 > Are we nearly there yet? This month marks twelve years since then Scottish National Party (SNP) leader, Alex Salmond, first spoke of his ambition to see Scotland become part of what he called the “Arc of Prosperity”. How’s that all going? Rather obviously, that ambition has not been fully realised. But has Scotland made any progress at all in the direction envisaged by Alex Salmond? The world was a very different place in 2006. The catastrophic collapse of the world’s banking system was a beast lurking largely unseen in the dark of the future. There was a confidence about the robustness and resilience of global capitalism which confused and confounded many of its critics. A confidence which within a year of Salmond’s remarks started to look like complacency. Harbingers of the impending crisis were to be found in some of the more arcane workings of the financial markets. But, despite what some of his critics would later claim with the benefit of hindsight, Alex Salmond’s optimism wasn’t at all inappropriate at the time and was probably shared by the larger part of the general public.